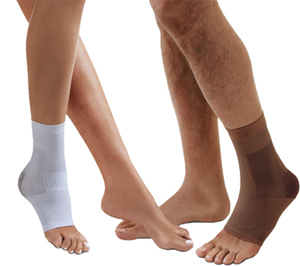 Kick your ankle pain goodbye with Solidea’s Cavigliera support sock! This meticulously designed ankle support is used by athletes and sports enthusiasts to provide strength and security for weak joints while walking, standing or working out. With an extra-firm, clinically graded compression of 23/32 mmHg this ankle support sock is designed to reduce swelling and soreness, relieve sprains and improve the recovery of ligament problems or injury. Solidea’s Support products work by applying pressure to the affected area in order to increase blood circulation, whilst the patented micromassage technology is able to soothe pain from aching muscles, torn ligaments and oedemic swelling. So much more effective than elasticated tubular support bandages, Solidea’s Cavigliera is specially moulded to the shape of your foot – meaning no more awkward folding or tying up loose ends that don’t fit properly! This ankle support is stronger, tighter and better adjusted to the contours of your foot, heel and ankle than other traditional bandages. Perfect for sports enthusiasts who won’t let wounds stop them, the ankle support alleviates pressure and pain during physical exercise and speeds up recovery and rehabilitation from sporting injuries. If you are prone to foot-related problems, the Cavigliera is even able to prevent and protect your foot from future twists and sprains that can really affect your fitness programme in the long run. Solidea’s ankle support is imperceptible beneath socks or can even be worn with sandals and flip flops thanks to the open-toe design - which is also useful for patients with trophic skin disorders or people who suffer with blisters, calluses or athlete’s foot. Solidea use silver ion technology throughout their compression garments, which helps kill germs and prevents the onset of bad odours - even after hours of wear. So unlike regular compression stockings, you don’t have to worry about taking them off in the changing rooms! This technology also encourages a speedier recovery from wounds, thanks to its bactericidal qualities; no more germs means no infections or complications. Designed with breathability in mind, the Cavigliera’s lightweight fabric helps your skin maintain the perfect temperature in all seasons without affecting its biological balance. Made with a comfort-knit so soft it feels like a second skin, Solidea’s dynamic ankle compression sock will keep your foot feeling fantastic throughout the day. The extra-flexible fabric makes it easy to put on and take off, while its stream-lined design ensures it never gets in the way and stays discreet at all times! Made using high-tech and innovative yarns that maintain extraordinary elasticity over time, you can wear Solidea’s ankle support sock time and time again, without it loosing thickness or pliancy.